You are here: Home » Is Marquette a bad job? Does ESPN have editors? Myron Medcalf wrote a thing on bad coaching jobs for ESPN today and threw Marquette in there. I bit, as I had never heard anyone say MU was a bad coaching job, and wanted to see the logic behind it. There wasn’t any. No, seriously, this piece makes Mike Hunt’s blog posts look like Pulitzer Prize Winners. I grew up in Milwaukee. Everyone in the area recognizes Marquette as a school with high academic standards and an occasionally impressive basketball program. But the top local athletes would choose Wisconsin over Marquette in most situations. The Chicago kids that a successful Marquette coach has to pursue have a multitude of options, too. The city has a lot to offer but the area that surrounds the campus doesn’t showcase the highs. And the Golden Eagles are residents of a Big East that lacks the lucrative TV deal that the old Big East commanded. That’s a problem for a Marquette team that spends significantly more per participant than any other Big East school. The Golden Eagles could use more cash. The private university is wrestling with financial problems. And it’s in the middle of a messy transitional period within its administrative ranks. The new regime could create academic barriers that might affect Steve Wojciechowski’s recruiting plans. Add the fact that the Golden Eagles play in the old U.S. Cellular Arena, and it’s easier to see why Marquette isn’t the most appealing job in college basketball. Let’s take this a sentence at a time. “I grew up in Milwaukee.” – Good start, making him an authority on the subject. “Everyone in the area recognizes Marquette as a school with high academic standards and an occasionally impressive basketball program” – Who is this everyone? Most people in Philadelphia, my residence, have no idea if MU is good academically or not and simply know it as that school Dwyane Wade went to that plays Villanova every year. Nationally, the basketball reputation outweighs the academic. And what is this about “occasionally impressive.” Maybe if this was 1990. Marquette missed one Tournament the last nine years and that was this season. I guess that’s occasionally impressive. ” But the top local athletes would choose Wisconsin over Marquette in most situations.” – Sure, just ask Duane Wilson and Deonte Burton. They love them some Badgers. “The Chicago kids that a successful Marquette coach has to pursue have a multitude of options, to” – What does this even mean? Doesn’t every player anywhere worth pursuing have a multitude of options? “The city has a lot to offer but the area that surrounds the campus doesn’t showcase the highs.”- True, you have to walk a mile to get to Water Street and a full 1.5 miles until you hit Lake Michigan. Goodness knows Storrs is a marvelous, wonder-filled city. “And the Golden Eagles are residents of a Big East that lacks the lucrative TV deal that the old Big East commanded.” – This is pathetic. A quick Google search would have shown Myron the folly of this sentence. Oh look, ESPN had a story on this last year. In some countries around $2 million is more than around $4 million, but this is not one of them. “That’s a problem for a Marquette team that spends significantly more per participant than any other Big East school.” – Again, Marquette is getting more TV money now than it was before. Whoops. “The Golden Eagles could use more cash.” – Good thing they are getting it. “The private university is wrestling with financial problems.” – It is. “And it’s in the middle of a messy transitional period within its administrative ranks.” – True that, if only they would have named a president already. “The new regime could create academic barriers that might affect Steve Wojciechowski’s recruiting plans.” – What is this “could” business. The world “could” end tomorrow. I “could” be working right now. Not to mention the old administration created academic barriers for the previous MU head coach, resulting in a top-10 recruiting class. Oh. “Add the fact that the Golden Eagles play in the old U.S. Cellular Arena, and it’s easier to see why Marquette isn’t the most appealing job in college basketball.” – They don’t. 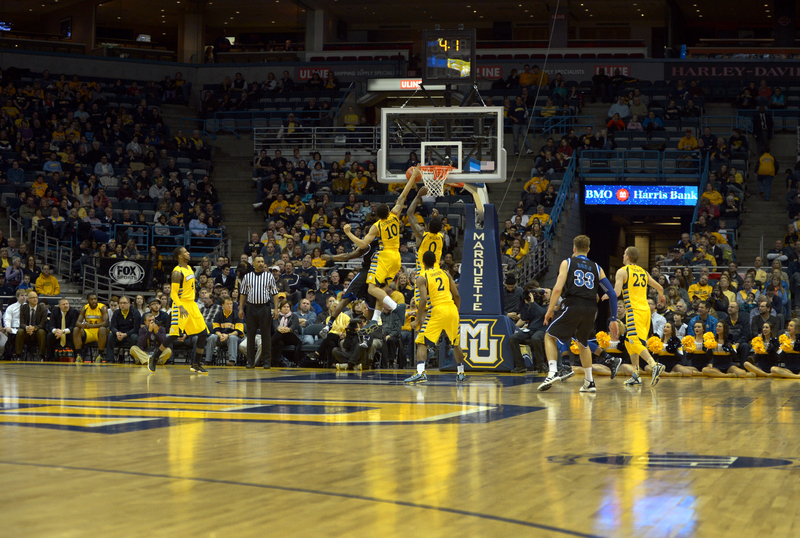 They play in the BMO Harris Bradley Center, an NBA arena equipped with Sports VU. And way to mention the new arena the Bucks might be getting. Long story short, you can argue that MU is a bad job, but you can’t make stuff up. Come back with facts next time and then we can talk. Is Marquette a bad job? Of course it is. The campus is located in a bad neighborhood (anyone who says different is living a lie), they have no field house (they have to schedule games on dates the Bucks are not playing) and they are located in non glamorous cold weather city. Marquette is a good school but that’s not enough. They do have a field house, “The Al”, but it seats less than 8k which is WAY too small. Also, the Eagles play at the BC on days when the Bucks play also. Check the schedule, it happens a lot on Saturdays in December and January. Not the presumption that “it” (the TV contract) would be problematic for MU, but that it does spend significantly more per participant than any other BE school. Granted, you had to infer that but regardless of the amount coming in from the TV contract, it’s an equal amount per school. This will help MU pay the bills but for other schools which fund BK less, their TV money will help more sports programs.